More sizes and styles arriving frequently, check back often! PLA (Polylactic Acid) is a bioplastic material made from renewable resources such as corn and sugar. It is a sustainable product and is compostable in industrial composting facilities. It is a great material to use in packaging as it is food safe and relatively inexpensive. ALOX (Aluminium Oxide) Coating is a clear barrier coating and when applied to flexible plastic film can achieve high oxygen and moisture barrier properties. ALOX is compostable and when used with a PLA film will create a high barrier, compostable package. 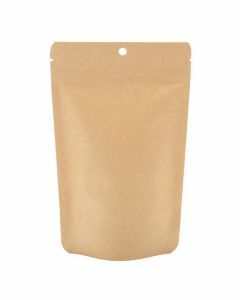 Eco Stand Up Pouches come in Clear, Kraft and White Kraft. The Kraft and White Kraft pouches come with clear oval windows or solid panels. All clear pouches come with resealable zippers while the Kraft pouches are available with or without zippers. Package coffee, tea, cookies, granola bars candy, powdered mixes, pet treats, and more. Easy to fill and heat seal to close. Sustainable packaging has never looked so good and kept products so fresh! 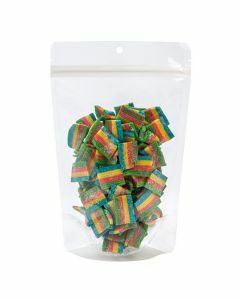 Eco Kraft Stand Up Zipper Pouches offer an eco-friendly package for food and retail products. The ZBGEK2 pouch measures 4" x 2 3/8" x 6" and holds 2 oz/57 g. Includes a resealable zipper, tear notches, and a round hang hole. This pouch provides a high barrier and is made from 100% compostable materials. Package coffee, snacks, and more. 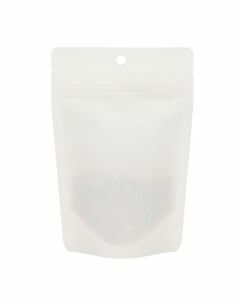 Our Eco Clear Stand Up Zipper Pouch offers a green solution for food packaging. 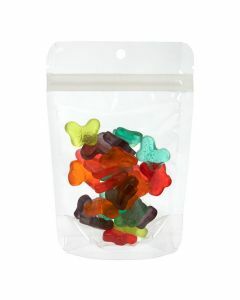 The ZBGE2 clear PLA pouch measures 4" x 2 3/8" x 6" and holds 2 oz/57 g. Package candy, snacks, vitamins, mixes, and more. Laminated with an ALOX coating for high barrier protection. Includes tear notches and a round hang hole. Our SUPEK2 Kraft Stand Up Pouch measures 4" x 2 3/8" x 6" and holds 2 oz/57 g. Package coffee, granola bars, candy, mixes, and more. 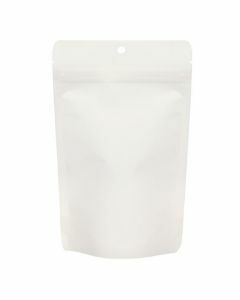 This pouch features a PLA lining and ALOX coating for a high barrier, making this pouch ideal for food products. The pouch has a round hang hole and comes open-ended (no zipper) for easy filling. Heat sealable. Our eco-friendly ZBGEO2K Kraft Stand Up Zipper Pouch measures 4" x 2 3/8" x 6" and has a clear oval window to show off your product. This pouch holds 2 oz/57 g of coffee, tea, mixes, and more. 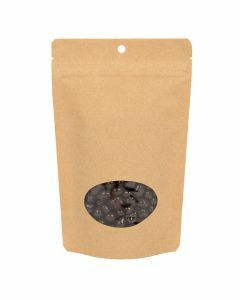 This pouch has a laminated interior and offers a high freshness barrier. Includes a resealable zipper, tear notches, and a round hang hole. 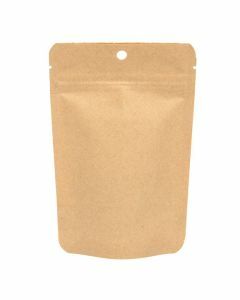 Our ZBGEK2W Eco Stand Up Zipper Pouch in White Kraft is great choice for food products. 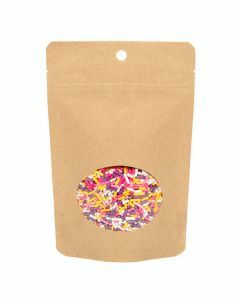 At 4" x 2 3/8" x 6", the pouch holds 2 oz/57 g of coffee, tea, candy, cookies, and more. The laminated interior offers a high barrier and is lined with PLA and an ALOX protective coating. Includes a round hang hole, tear notches, and a resealable zipper. Heat sealable. Our SUPEK3 Eco Kraft Stand Up Pouch measures 5 1/8" x 3 1/8" x 8 1/8" and holds 4 oz/113 g. This food-safe pouch comes open-ended (no zipper) and includes tear notches and a round hang hole. Package grains, mixes, snacks, candy, and more. The inner lining is laminated with PLA and a clear (ALOX) protective coating to provide high barrier protection. Our Eco Kraft Stand Up Zipper Pouch with Oval Window offers a sustainable package with high barrier protection. The ZBGEO3K pouch measures 5 1/8" x 3 1/8" x 8 1/8" and has a clear oval window. Package coffee, tea, grains, chips, mixes, and more. Includes tear notches, zipper, round hand holes, and a high moisture and oxygen barrier. Give your products a polished look with this Eco Stand Up Zipper Pouch in White Kraft. Our ZBGEK3W pouch measures 5 1/8" x 3 1/8" x 8 1/8" and holds 4 oz/113 g. Package coffee, tea, candy, and more. The interior is laminated for extra strength and barrier with plant-based PLA and a clear protective coating. Includes tear notches, a resealable zipper, and a round hang hole for retail. Our Eco Kraft Stand Up Zipper Pouch offers a high barrier to keep food products fresh. The ZBGEK3 pouch measures 5 1/8" x 3 1/8" x 8 1/8" and holds 4 oz/113 g. Package cookies, granola, grains, and more. 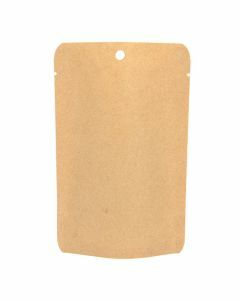 This 5 mil pouch is laminated with PLA and has an ALOX protective barrier coating. Includes a resealable zipper, tear notches, and a round hang hole. The ZBGE7 Eco Clear Stand Up Zipper Pouch measures 5 7/8" x 3 1/2" x 9 1/8" and is ideal for 6-11 oz/170-312 g of dry goods. Package coffee, grains, cereal, pet treats, and more. 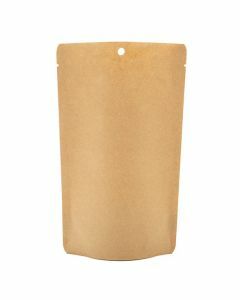 This eco-friendly pouch is made from plant-based PLA and is laminated with an ALOX coating for high barrier protection. Includes a resealable zipper, tear notches, and a round hang hole for retail.